Vital Wellness & Weight Loss Blog Can ReShape® Gastric Balloons Help You Lose Weight? There’s no doubt that the ReShape® gastric balloon can help you lose weight. It immediately gets you off to a good start, helping you eat less by making you feel full fast. When you get the ReShape system at Vital Wellness & Weight Loss, we don’t leave you to fend for yourself; we provide a year of professional support including medications, education, and motivation. You can call our offices to learn more about the ReShape gastric balloon. And if you’re still not sure whether it’s right for you, here’s some information that will help you decide. Gastric balloons are exactly that — balloons — made of soft silicone. In a nonsurgical procedure that takes about 20 minutes, the gastric balloon is placed in your stomach using a narrow endoscope that goes through your mouth and down your esophagus. The balloons are inflated after they are in place, so they fill up a large part of your stomach. As a result, you feel full quickly and eat less. They also hold off hunger throughout the day. Sensors in your stomach wall tell the brain that your stomach is full, so the brain doesn’t trigger the release of hormones that make you feel hungry. Gastric balloons accomplish the same goal as bariatric operations that make your stomach smaller, so you eat less. 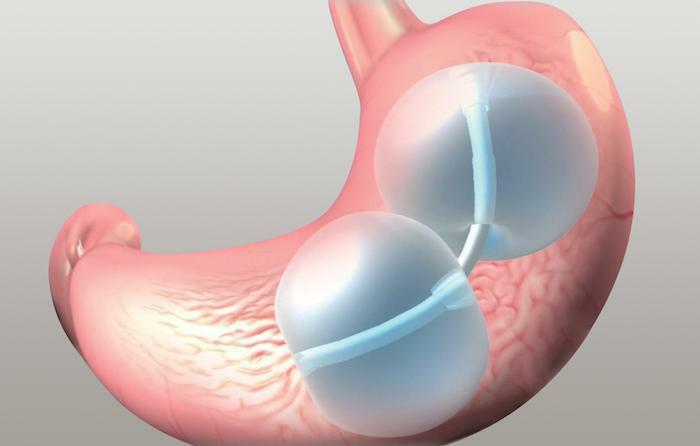 The difference is that the balloon is temporary, while surgery permanently alters your stomach. ReShape consists of two balloons that are connected with a tube. Since they’re made from medical-grade silicone, they’re durable and safe to put in your stomach. The dual balloons make a big difference because they have the unique ability to assume the natural shape of the stomach. Your stomach is crescent shaped, with an upper part that’s larger than the lower stomach. With ReShape’s innovative design, a balloon can be inflated in each area, which is more effective and takes up more space in your stomach compared with a single gastric balloon. Thanks to its dual-balloon shape, you can fill up a large portion of your stomach yet still feel comfortable. You can’t get the same advantage by filling up one balloon in the top of your stomach. Reshape is an exceptional way to kick-start a diet. With the balloons in your stomach, you’ll see rapid results, which is a health benefit and also boosts your motivation to stick with a long-term weight loss plan. Gastric balloons are never left in your stomach for a long time. The ReShape system is designed to stay in place up to six months. You can have it removed before then, but it must be taken out within six months. This means you have six months of weight loss with the help of the balloons, but when the balloons come out, you still continue to lose weight. We will be with you for another six months ensuring continued weight loss and helping you reach your goals with medications, lifestyle support, and nutritional counseling. When you choose the ReShape system, you also get a year of professional support to help you reach your weight loss goal and maintain a healthy weight. With professional support, you’ll be in the habit of eating a calorie-controlled diet and exercising by the time the ReShape balloons are removed. Let’s get down to the bottom line and talk about the results people typically get with ReShape. For starters, with most gastric balloons, patients lose up to one-third of their excess weight. By comparison, ReShape patients lose about 43% of their excess weight. Although some ReShape patients have lost a phenomenal 60-80 pounds in six months, that may not be a realistic goal for everyone. In clinical trials, patients lost 28 pounds on average, or 12% of their body weight in the first six months. Finally, most patients continued to lose weight after the ReShape gastric balloons were removed, and they successfully kept it off. To learn whether you’re a good candidate for ReShape, call Vital Wellness & Weight Loss or book an appointment online. As women get within 5-7 years of menopause, the cessation of their menses, there are a number of hormonal imbalance symptoms they can experience.